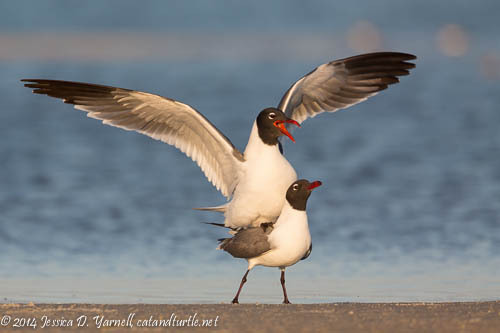 The gulls with the black heads, the ones that sounds like they are laughing at you, are pretty common birds. 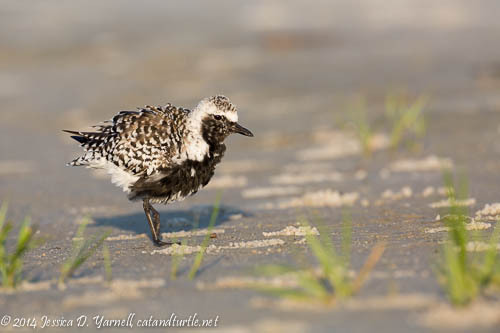 But even common beach birds can be fun to photograph. A bird on another bird’s back is a good bird! Beach birds with long orange beaks are good. 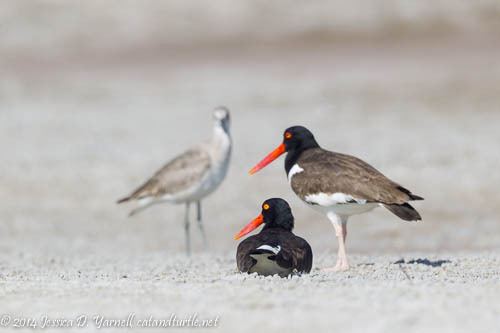 They are the American Oystercatchers, and at this time of year, they are often in pairs. 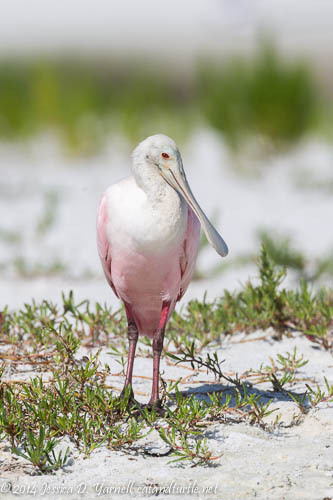 I’ve read that several pairs nest at Fort De Soto, and I would just love to see their little babies. I almost got a shot of this pair mating. The male was hopping onto the female’s back when the female decided she wasn’t interested. She took off running, leaving her partner flapping in mid-air. He chased after her fussing madly. Then they reconvened together on the beach, with this willet looking on as chaperone. Hey, this is a family-friendly beach, guys! Red birds are good beach birds. Not just Big Red, the resident Reddish Egrets who always put on a good show with their “drunken sailor” dance. 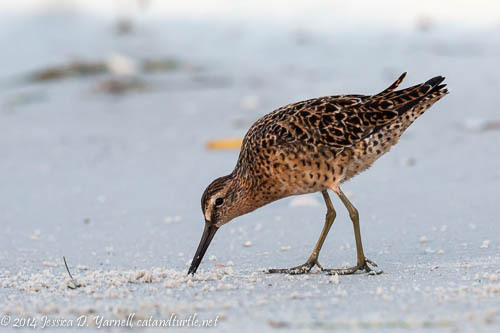 Lots of the shorebirds, like the Short-billed Dowitcher above, are getting a brownish/reddish hue in their feathers right now as they molt into their breeding plumage. May is just about the only time in Florida that we get to see these birds in their fancy feathers. When they return from their Arctic breeding habitat in a few months, their feathers will be well-worn after thousands of miles of flying. White birds with black heads are good birds. These are the terns. They are all courting right now. 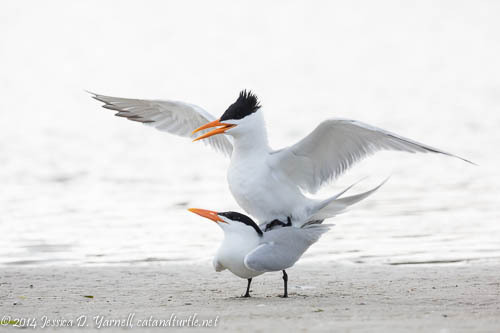 I got some great images of the Royal Terns mating a few weekends ago. Then on my first night of this particular visit, I got to see Least Terns exchanging fish as part of their courtship ritual. I was really hoping Rich would find a nice flock of these guys on the beach somewhere, but I think they’ve moved off to other beaches to make their nests. Birds doing a lot of fussing are probably good. 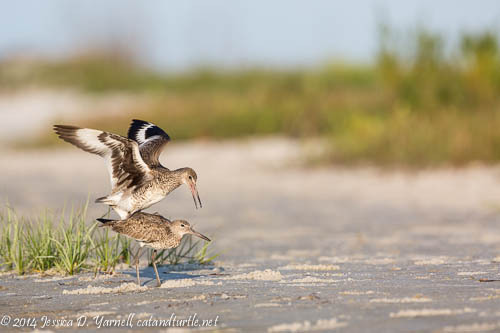 Like this pair of Willets, who had a long pre-mating ritual. The male flapped his wings and announced his intentions to his mate. I was surprised at how long he went on, and I switched into video mode to capture his calls. He edged closer and closer until he finally hopped onto her back…. So Rich headed off on his walk and I continued photographing the shorebirds around the lagoon area. After several hours, I hadn’t gone far and I hadn’t gotten any calls, either. When I met back up with Rich, he was reading near the wooden bridge. I asked him if he’d seen any good beach birds. None at all, he said! Hehe, smart guy! I should be grateful that you’re not posting a picture of me dripping wet after spending all morning up to my waist in water! How fun! You sure got some great shots! Teamwork at its best! Dessert is served! 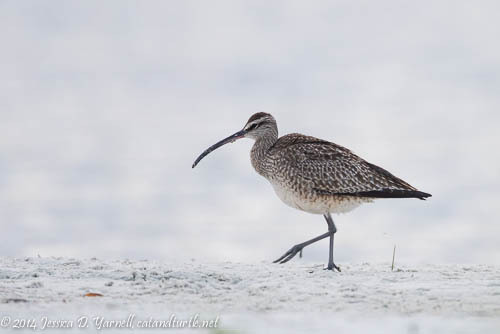 Congrats on the whimbrel. You’ve had quite the spring at FD this year … With more to come! You caught lots of great stuff that morning. Next time, you should have him go get and lunch and bring it back to the beach for you. Pizza on the beach? I like the way you think, Dina! I love your work! Quite jealous of that Whimbrel image! Very nice! Now I’m going to have to make extra coffee in the morning and review your site at leisure – and from what I’ve seen and read so far – with anticipation of pleasure.